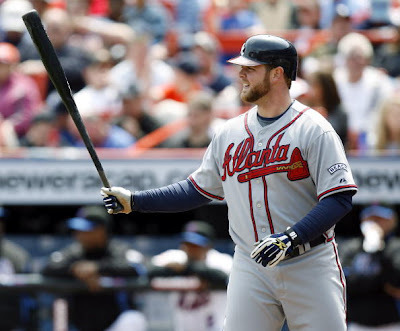 An Opinion On Sports: Atlanta Braves: Yes We "McCann"! The Atlanta Braves are in the thick of a running to make the playoffs. Just like old times, huh? Somewhat, but this time the realistic chance is probably as a wild card team as opposed to a division winner. The Braves have 38 games remaining in the regular season. They are currently in second place in the eastern division , 6.5 games behind the Phillies. They are in third place in the wild card standings, 4 games behind the Colorado Rockies. The Phillies can mathematically be overcome, and we play them six more games head-to-head down the stretch. However, I don't see the Braves sweeping the boys from Philadelphia, so those games will evaporate in a hurry. But if Atlanta continues to win series against teams in their division, there is still time to pull off a shocker. Brian McCann and Chipper Jones will have to be flawless from here on out, the starting pitching must keep giving the team a chance to win each night, and the bullpen will have to come through in all clutch situations. But it "McCann" be done. Yes it "McCann"!